In America, Oney Lorcan & Danny Burch are revved up to fight the Grizzled Young Veterans for the NXT UK Tag Team Championships in three weeks. 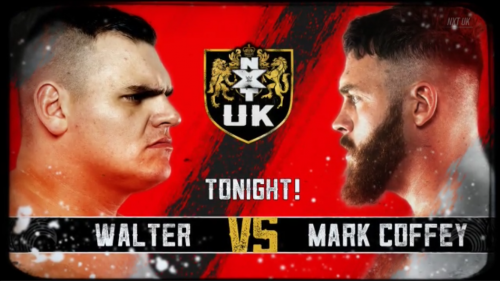 In England, Pete Dunne was impressed with WALTER’s in-ring debut. But he’s not scared, and he’s ready to face him when the time comes. Jordan Devlin is going to make a statement against Noam Dar when NXT UK comes to Phoenix, because he’s offended that Dar only had a couple of matches for the brand and then ran back to America. That could be quite good. Gallus is getting hyped up backstage. Next week, Wolfgang is taking on Pete Dunne. They want to end the Bruiserweight and take out WALTER while they’re at it. Elsewhere, Jinny rips Radzi’s appearance and says she’s tired of Toni Time. She wants to take on the winner of the Women’s Title match in Phoenix. She’ll take on Mia Yim next week.